There is always a dark side existing in every human being. In some it’s just a bit, but in some it’s way too much that makes the person to do unthinkable and dreadful things. Things that perhaps would never happen in animal world. But after you watch The Boy and The Beast you might get an opportunity to discover something unique about yourself, as this film offers a heartwarming story that touches every single subject possible for you to think about. An orphaned boy lives on the streets of the big and noisy Shibuya, when a fantastic creature finds him. When the beast sees no dark side in the little child, it decides to train him in martial arts, discipline, and the importance of not behaving like a real human being with a dark side. However, soon the beast realizes that his uncontrollable temper and impatience slowly disappears when the boy starts teaching him some manners that helps him to gain more respect in his own world. It is quite fascinating to see how a 9-year-old boy, Ren (Sometani/Vale), with an even worse attitude than Kumatetsu is able to find a common language with his teacher through constant yelling, frustration and kindness, which is what their relationship was based on. However, there are a few central conflicts happening in this anime where Ren questions himself how far he wants to go if he allows himself to open his mind to a new change, and allow Kumatetsu to guide him into a new world. Even many years after, when Ren is a grown up man, he remains as he used to be with Kumatetsu, but now much stronger, wiser and disciplined. Since Kumatetsu wishes to become the next Superior, it’s Ren who always appears as the strong chain for the Beast to finally get what he desired most. But one day the things will change. The dark side of one human being will prove to the Beasts that it’s always better to stay away from any man if they want to keep their peace as it is. 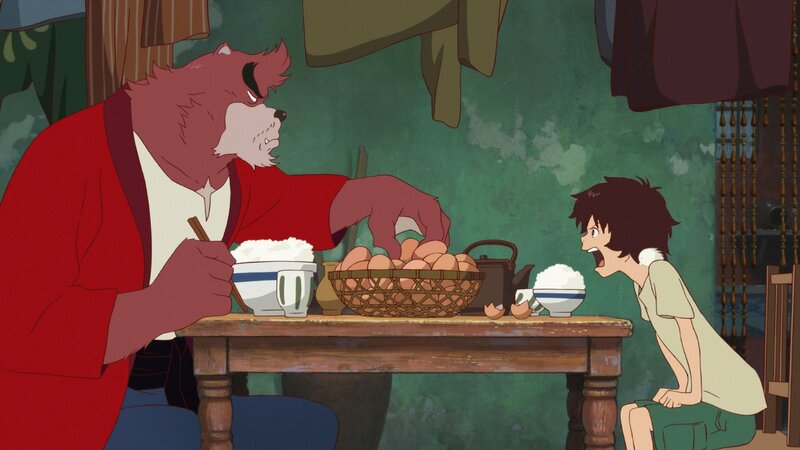 The Boy and The Beast is a Japanese anime with full of metaphors, suggestions, and clever scenes. It highlights the difference between a beast and a human being, and who can bring more damage. But it’s also about teaching, parenthood, bravery and self-determination. With its profound and deep story, Mamoru Hosoda’s film will keep you busy for two hours, but you will feel like you spent only an hour to watch it. In the end, it’s intelligent and more importantly, an educational film that should never be missed under any circumstances. However, it is you as a viewer who will decide whether it was as good as I tried to describe or even better. For that, you will have to give it a try and enjoy its outcome.